Share Our 13 Favorite Ghost Stories—Just in Time for Halloween! Halloween is fast approaching, which means it’s time to start prepping for all the ogres, goblins, ghouls, and ghosts you’re sure to meet come October 31st. Lucky for you, there’s a plethora of spooky reads to get you in the spirit. Here are 13 of our favorite ghost stories. When Julia and Valentina inherit their deceased aunt Elspeth’s apartment bordering London’s Highgate Cemetery, they are semi-normal American teenagers. But as they come to know the building’s other residents—Martin, a charming and obsessive-compulsive crossword puzzler; Marjike, Martin’s devoted wife; and Robert, Elspeth’s elusive lover—they discover that much is still alive in the cemetery, perhaps even their aunt. Intensely attached twins Julia and Valentina move to London when their aunt dies and leaves them her apartment on the edge of Highgate Cemetery. As they become involved in the lives of the eccentric neighbors, the twins discover that much is still alive in Highgate—including, perhaps, their aunt. Set at a fading amusement park in a 1970s beach town, this novel follows college student Devin during his summer job as he discovers the rides might just be haunted by the ghost of a murdered girl. Part coming-of-age story, part mystery, part supernatural, and all deliciously Kingsian. Not your typical haunting, the ghost in THE LOVELY BONES is the 14-year-old victim of a brutal murder. She watches from the afterlife as her family struggles with the loss and follows her killer in the desperate hope his crime will be discovered. A tough subject, but also a beautifully compelling exploration of family drama. A surreal, genre-breaking cult hit, HOUSE OF LEAVES is less a novel than it is an amalgamation of footnotes, manuscript pages, a film account, and crazy marginalia. The horror at its heart is the story of a family who move into a new house to start over, only to discover their home has supernatural qualities larger on the inside than the outside, endlessly shifting hallways, and secrets that gnaw at the dark places in everyone’s soul. Read the full review of HOUSE OF LEAVES. A young family that moves into a small home on Ash Tree Lane where they discover something is terribly wrong: their house is bigger on the inside than it is on the outside. Of course, neither Pulitzer Prize-winning photojournalist Will Navidson nor his companion Karen Green was prepared to face the consequences of that impossibility, until the day their two little children wandered off and their voices eerily began to return another story -- of creature darkness, of an ever-growing abyss behind a closet door, and of that unholy growl which soon enough would tear through their walls and consume all their dreams. In this stunning debut inspired by Chinese folklore, a young woman from a genteel but bankrupt family in colonial Malaysia is approached by wealthy parents to marry their son. Except their son is dead, and she would be his ghost bride, an ancient tradition used to placate a restless soul. The arrangement would solve her family’s debts, but she soon realizes there might be much darker consequences. While there are no actual ghosts in REBECCA, the ever-present reminder of the first Mrs. de Winter drives every character in this classic and harrowing story. If a massive, mysterious estate doesn’t seem creepy enough, add in the “accidental” death of the revered former mistress and the sadistic tendencies of a certain Mrs. Danvers to get the full effect. Our poor naïve American narrator never stood a chance against the ghostly expectations of her new husband’s murdered wife. Read the full review of REBECCA. I watched the classic Hitchcock film of Daphne Du Maurier’s gothic masterpiece starring Laurence Olivier and Joan Fontaine for the first time in years the other night, and in loving it was reminded of how much I also loved the book. Is there a first line of a novel more evocative than “Last night I dreamt I went to Manderley again”? Only Hitchcock could do justice to the moodiness and plot twists of Du Maurier’s genius work. In what is arguably the greatest haunted house story, a scientist is determined to uncover the truth about the paranormal, but he doesn’t count on Hill House’s effect on one of his assistants. Terrifying and suspenseful, this novel proves that some houses are born bad. A dilapidated manor isolated in a foggy marsh, the cries of a child in the middle of the night, a silently stalking specter of a woman in black—this classic novella has it all in a shivery tale of a mother’s vengeance. One of the earliest ghost stories to pose the question, Are the ghosts real or is the main character insane? THE TURN OF THE SCREW is an influential and shivery tale of two odd children and the governess who believes something evil has taken root in her charges. Judas Coyne is a retired rock star with too much time and not enough distractions. In an attempt to nurse his chronic boredom, he begins buying relics of the deceased. Judas winds up getting more than he bargained for, however, as the bereaved ghost of a dead man’s suit begins haunting him and his girlfriend. After a mysterious note informs Mahony that his mother may not have left him at the orphanage by choice, he returns to his hometown, a small Irish village called Mulderrig, to get to the bottom of things. His return awakens all the peculiarities Mulderrig has to offer, with ghosts rising from their graves and the local priest trying everything he can to get rid of Mahony. This darkly comic adventure will have you clutching your stomach out of fear and laughter alike. Following the suicide of her elderly husband, performance artist Lauren Hartke falls into a deep state of dissociation. There she meets an ageless man with mannerisms and memories similar to those of her late husband. Desperate to understand who she is and what it was that led to her husband’s demise, Lauren embarks on a journey into the wilderness of time, love, and human perception. For the person already over Halloween and living for December, A CHRISTMAS CAROL is a ghost story about Ebenezer Scrooge, a cranky old businessman who is visited by the ghosts of his old business partner and Christmas Past, Christmas Present, and Christmas Yet to Come. By showing Scrooge scenes of Christmas in the lives of those around him, the ghosts grant him the restorative gift of perspective and generosity, bringing about a welcome transformation so late in the oldster’s life. 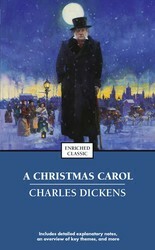 Read the full review of A CHRISTMAS CAROL.